Over the next five years, more than 1 billion new users are expected to come online, this will grow internet usage from the three billion we have now to 4.1 billion by 2020. These users are expected to consume more bandwidth especially video services. Of all the internet traffic, video continues to be the leading content consumed, and will accounts for 79 percent of global internet traffic by 2020 up from 63 percent in 2015. Services such as Youtube and Netflix are some of the high consumption areas, devices such as Google Chromecast and Apple TV shipped approximately 3.2 million and 1.7 million respectively over the first quarter of 2016. "The world will reach three trillion Internet video minutes per month by 2020, which is five million years of video per month, or about one million video minutes every second. HD and Ultra HD Internet video will make up 82 percent of Internet video traffic by 2020—up from 53 percent in 2015," said Cisco. IHS which release a similar report points to rich media as a driving factor behind the growth in IP traffic. “The proliferation of media-enabled connected endpoints has implications for media consumption, media production, broadband infrastructure, and the business itself of network management and traffic discrimination. It drives media consumption, IP traffic and more,” said Merrick Kingston, principal analyst-connected home, at IHS Technology. The adoption of personal devices, especially smartphones is one of the major growth area, "year-on-year, smartphones contribute roughly half a billion new devices to the market; tablet and OTT set-tops are also growing quickly, but operate a full order of magnitude below the smartphone. By 2020, this ratio will only widen. Within the forecast period, the smartphone-to-tablet ratio rises to nearly 10:1", said IHS. Adding the growth in smartphone is the growth in machine-to-machine (M2M) and Internet of Things (IoT) connections including the connected home will have an even greater impact on traffic growth. Over the next five years, global IP networks will support up to 10 billion new devices and connections, increasing from 16.3 billion in 2015 to 26.3 billion by 2020. The connected home segment will have the largest volume of M2M connections. Applications such as video surveillance, smart meters, digital health monitors, Smart thermostats, solar PV installations, connected lighting, and electric vehicle (EV) charging systems and a host of other M2M services are creating new network requirements and incremental traffic increases. Within the home connected health solutions will have the fastest growth (five-fold) of M2M connections from 2015 (144 million) to 2020 (729 million). 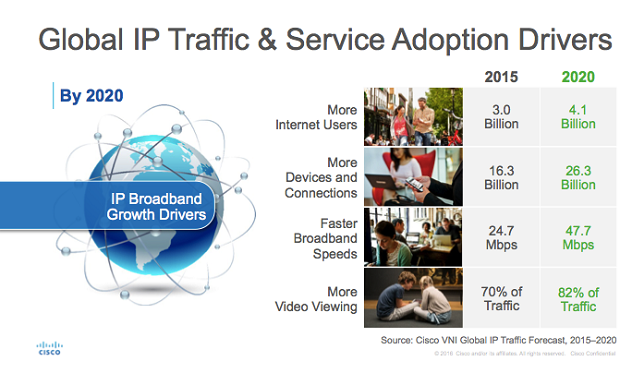 According to Cisco the accelerating growth in traffic shows a growing security problem. For the first time for the Visual Networking Index, Cisco has collaborated with Arbor Networks to help quantify the current and future threats of DDoS (Distributed Denial of Service) attacks. DDoS incidents can paralyze networks by flooding servers and network devices with traffic from multiple IP sources. This type of attack as led a number of high profile internet service outage on Twitter and Facebook. The DDoS analysis suggests that these types of breaches can represent up to 10 percent of a country’s total Internet traffic while they are occurring.